My Instant Pot is my new favorite toy in the kitchen-I bought it a while back because it seemed to be taking over my Pinterest feed and I was getting emails asking how to convert recipes for the Instant Pot and y’all know me-if you guys want Instant Pot recipes, that’s what I’m going to give you! 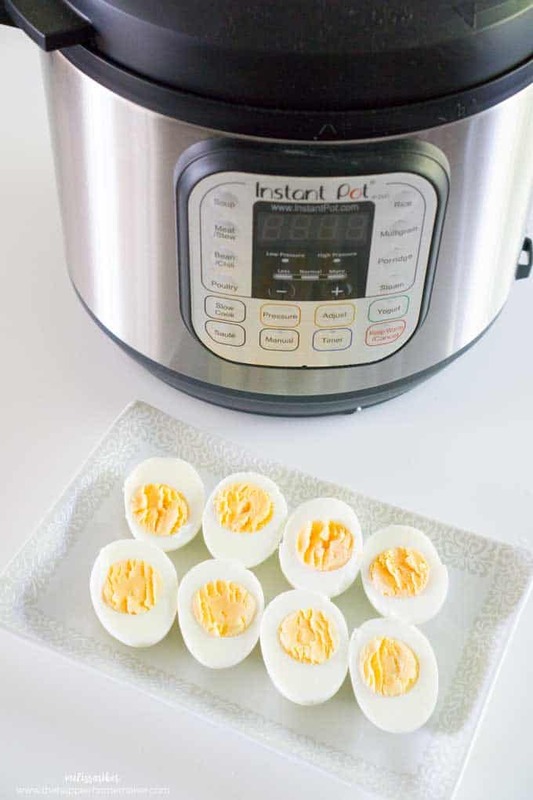 I’m going to start slow though today with these easy Instant Pot Hard Boiled Eggs because not only does it take me a while to test recipes a few times to make sure they are right for you when trying a new cooking method but, because we’re in the UK and I bought a US voltage Instant Pot, I have to drag this baby into my living room where I keep a big transformer for my TV in order to use it-I promise it’s as hilarious as it sounds! (Incidentally, I have to do that for my KitchenAid Mixer too because I’m too cheap frugal to buy another $100 transformer that will take up half my kitchen counter. Anyways….back to the Instant Pot hard boiled eggs. I love, love, love hard boiled eggs-I always have about a dozen in the fridge. Not only to I eat them with salad or as a healthy high protein snack, my three boys devour them too. So you might ask yourself…why can’t I just boil them on the stove? Why should I make them in the Instant Pot? Well, my friend, the simple answer is of course it’s easy to boil them on the stove-I have a blog post here about how to boil them perfectly. But for me? I have a startling history of forgetting my eggs on the stove, evaporating all the water, then exploding the eggs. Yes. That’s what happens when you’re distractible like me. And yes, I have done this quite a few times! So, if you have an Instant Pot (this is the one I have) then we can easily use it to hard boil our eggs (steam them technically!) and avoid exploding eggs. Good deal all around. Simply pour 1 cup of water in the bottom of the Instant Pot and place the rack inside (you can use a steamer basket also.) Place the eggs in a single layer on the rack. Close the lid and set the timer to 5 minutes on high pressure. It will take 4-5 minutes for the pressure to build up, then the 5 minutes to cook. Afterwards let the pressure release naturally or if you’re in a rush let it sit five minutes then do the quick release. 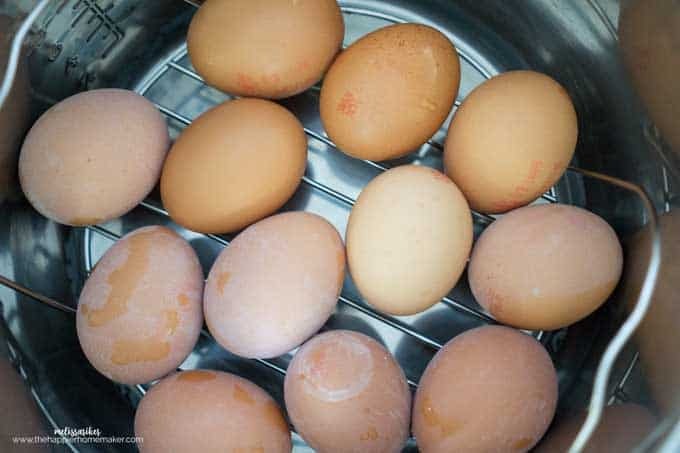 Open the top and remove the eggs and rinse in cold water. You can peel them immediately or later. Easy-peasy! So-tell me, am I the only one out there that has exploded eggs? Anyone else a recent Instant Pot convert? Oh my gosh! I thought I was the only one that has ever done that! Not only does it make a mess but a very stinky one at that! I have never heard of an Insta-Pot! I will be on the look out for them here in Charlotte, NC! Thanks for the info on this new item! Looking forward to new recipes to come. Thrilled that you will be converting recipes to the Intant Pot. I’ve had it for months and used it only once. Yes, I too have had eggs explode on me. You are the best! Thank you for your reply! Please tell your husband that we all admire his role in helping all of us as you experiment. Do you have to prick the eggs before cooking/steaming under pressure? So, one day I was at the nail salon and learned from a hound boy there that the easiest way to make hard boiled eggs perfectly was to put them directly into an electric kettle full of water and turn it on. Once it clicks, turns off and cools down a little I took the eggs out and they were perfect! I’ve never exploded an egg, but I always get the green ring around my boiled eggs. HATE IT! My daughter refuses to eat them, is that the sulfur in the eggs that causes this??? I’ve tried every trick in the book and rarely do they still come out good for me, either under done or I get the green film around the yolk. I just became a instant pot convert (whoop-whoop!) and love how easy it is!!! BUT, I still go the green ring on a batch of eggs I did. The first time it worked so well, 2nd time around – not so much. I don’t remember what I may have done differently but I’ll follow your instructions to the T and see how they come out. Thanks for this!!!! I consider myself a good-cook who’s comfortable in the kitchen and prepares a lot of traditional Mexican cuisines, but I can’t boil an egg to save my life. HAHA!